To mark 60 years of independance of Ghana. The Central Bank issued a special 5 Cedis Banknote in circulation. The new banknote displays an engraved portrait of Dr James Kwegyir Aggrey, the famous educationist and missionary, who lived from October 18, 1875 to July 30, 1927. Dr. James Kwegyir Aggrey contributed immensely to education to the then Gold Coast. 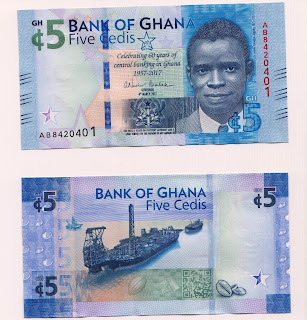 The commemorative note is coloured blue like the existing GHC5 note and the reverse side features a seaborne oil-drilling rig in the Tweneboa, Enyenra, Ntomme (TEN) offshore field It has hologram security mark. The Banknotes have been limited in quantity.